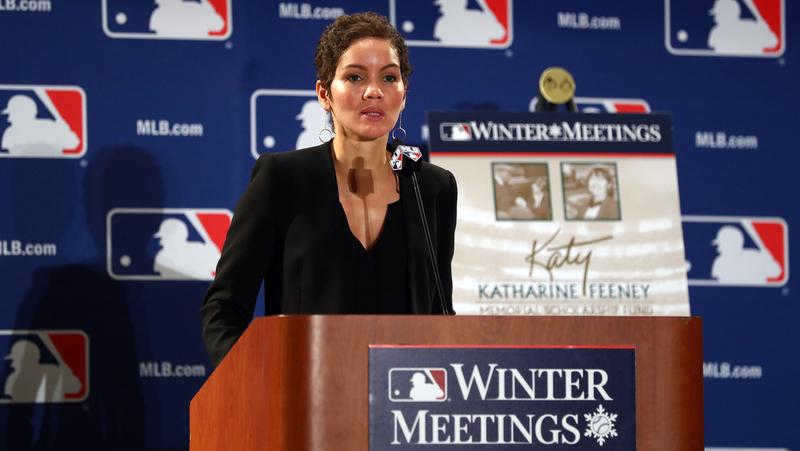 Major League Baseball Is Trying To Bring More Women Into Front Offices And Fields MLB is on par with other professional leagues on gender diversity, but women say they still feel the need to justify themselves. "There's a lot to do," says MLB's chief diversity officer. As MLB's Chief Diversity Officer, Renee Tirado oversees a number of initiatives to bring more women and people of color into all levels of the sport, from front offices to the field. She says, "there's a lot to do." Major League Baseball is staring down a gender problem. Despite initiatives meant to bring more women into its dugouts, executive offices and broadcast booths, everyone — including women in high-powered positions — believe things won't change quickly enough. "Look, I think there's no sugar-coating this. There's a lot to do," said Renee Tirado, MLB's chief diversity officer. In 2018, MLB earned a gender grade of C on the yearly report card issued by The Institute for Diversity and Ethics in Sports. Essentially, that means 30 percent of employees in pro-baseball are women. But MLB told KCUR that all across the league just 188 women work in baseball operations roles, doing things like looking for the best talent, negotiating contracts or scouring data to optimize player skills. That encompasses jobs in the commissioner's office plus all 30 teams and those teams' minor league systems. I've been honored to sometimes be referred to as a trailblazer, but it's pretty exhausting when you blazed a trail and there's nobody following up behind you. And in 150 years of Major League Baseball, no woman has been a general manager or a manager. New York Yankees' Jean Afterman is one of only three women who've risen to the assistant general manager level. "I've been honored to sometimes be referred to as a trailblazer, but it's pretty exhausting when you blazed a trail and there's nobody following up behind you," said Afterman, who is 62. While the conversation about gender parity in major league sports may not be new, there's a renewed focus. The NFL's Tampa Bay Buccaneers just hired two women as assistant coaches. Notre Dame women's basketball coach, Muffet McGraw, recently declared she was done hiring men for her staff and advocated for hiring more women as leaders in sports. And ESPN analyst Jessica Mendoza, who like other women broadcasters, has been criticized for showing off her baseball smarts, joined the New York Mets' baseball operations staff as an advisor about a month before the season started. There is no single definition of "baseball operations" across Major League Baseball. Twenty-four of the 30 teams confirmed to KCUR how many women they had in such roles, though some teams counted the media relations crew, and most counted administrative assistants, who often help with contracts and other important front-office functions. We'll be in a meeting with everybody, and they look around, they're like, 'Wow, you really are the only female. That's weird. The Kansas City Royals are among the top five teams with women in baseball operations roles across the major and minor leagues, MLB said. But on the pro team, the Royals, there is just one woman: lead dietitian Erika Sharp. "But ... it's just a typical day and they all treat me like their little sister. They call me little sis sometimes," she said. Sharp, 30, is in her second season with the Royals, having previously worked with the San Francisco Giants, Arizona Cardinals and Phoenix Coyotes. She said she's been lucky in that she hasn't felt like her gender has been a determining factor, though she acknowledged that her profession as a dietitian is generally dominated by women. Gender parity doesn't feel like a large hurdle to overcome, Sharp said, but it'll be key to build "the confidence of the upcoming working class and generation of females entering in, that there are positions and you can do these things. You just have to go in and work hard like everyone else does." Tirado, MLB's chief diversity officer, said she is trying to evolve the game's "culture to make this a sport of choice for women, whether it's networking, the business side or baseball operations." MLB is trying to do that with the Diversity Pipeline Program and a fellowship program for baseball operations roles. Both are meant to equalize the league's gender and racial hiring. Roughly 20 percent of MLB's workforce is racially diverse, earning it a B+ for racial diversity in the institute's report card. It's a change from how MLB did things under former Commissioner Bud Selig. Afterman, the Yankees executive, referenced the "Bud Selig rule." As she described it, "if you are going to hire anybody in a senior position in a baseball operations department or a manager, you had to interview a diverse candidate, and all that was was ticking a box without any meaning to it." 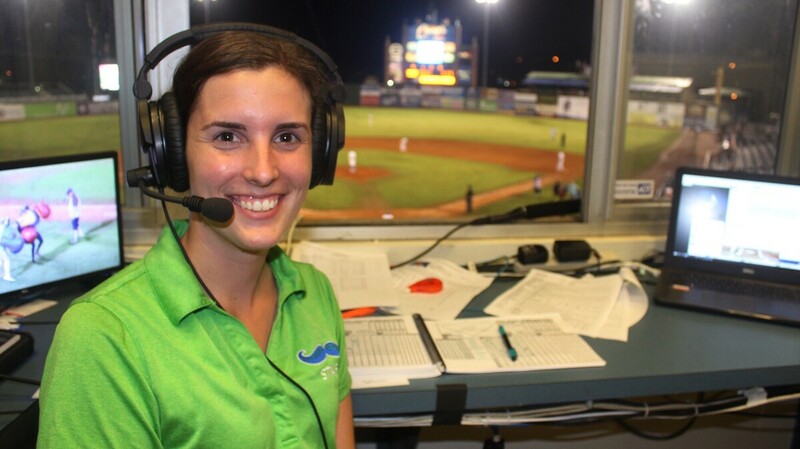 Emma Tiedemann is the Lexington Legends' play-by-play announcer and director of media relations for the team, which is the low-A affiliate of the Kansas City Royals. She's been broadcasting sports since she was 15. She said teams would just report back to the commissioner that, 'I did exactly what you told me to ... and I'm going to just hire the white guy that I wanted to.'" MLB's goal now, according to Tirado, is "always to improve the numbers, but not improve the numbers for the numbers' sake." Diversity programs may not always work as expected. A 2016 Harvard Business Journal report noted that as initiatives to promote diversity proliferated in the U.S., the percentage of white women who became managers increased by 7 percent from 1985 to 2000 and black men only budged by .3 percent from 1985 to 2014. And by diversity, "we're talking about who is part of the organization and who is not a part of the organization," said Geraldine Cochran, an assistant professor of physics at Rutgers University who has written about and advocates for diversity and inclusion efforts. The Harvard report said that the most effective diversity initiatives rely on recruiting, mentoring and a diverse management staff, but Cochran insisted there's another component, too: examining whether the efforts are making a difference. "There is no-one size fits all diversity plan that's going to work at every organization. It needs to be an iterative process of making the changes, and then doing research to see if those changes were actually successful, and doing research to find out where the actual problems in the organization are," she said. Diversity initiatives weren't a thing when Greg Pryor played in the majors in the 1970s and 1980s with the Texas Rangers, New York Yankees, Chicago White Sox and the Royals. "I came through baseball when it was very rare to see a woman in the front office or very visible as they've been in regards to a baseball," said Pryor, who remembers when women in the media were just being let into clubhouses. The only woman he said he dealt with from a team standpoint was Nancy Faust, the organist at Comiskey Park in Chicago. "A lot of times in baseball, that change comes very slowly," Pryor said. He said he thinks fathers are encouraging more daughters to go into the sports they love. Pryor's youngest daughter, for instance, previously worked for the Dallas Cowboys. San Diego Padres Assistant General Manager Josh Stein started out with the team in 2003, and he had the rare chance to work with a high-ranking woman — Priscilla Oppenheimer, who was the director of minor league operations. But, he noted, the Padres dropped off the radar for a little bit. "Definitely there was, I would say, a little bit of a gap in terms of women working in the Padres' front office," he said. "We've really seen an influx over the last few years of more and more applicants, more and more hires and some women doing great work in our baseball operations." Currently, six women work in baseball operations for the Padres. Stein said that the key to bringing more women into the game is having them start in entry-level roles. "I think if you look at, regardless of gender, the folks in professional sports that have risen to the top, it typically starts with internships. It starts with very basic coaching positions or scouting positions," he said. "And it tends to be a long, slow journey to the top." Among the up-and-comers is Emma Tiedemann, who is with the Royals' low-A minor league team in Kentucky. The 26-year-old has broken the gender barrier a couple of times already: in 2014 with the Alaska Baseball League and in 2018 in the South Atlantic League. Today, She does both the play-by-play and color during radio broadcasts for the Lexington Legends. It runs in the family. Her grandfather was the broadcaster for the University of Texas at Dallas and at 15, Tiedemann joined him in the booth to keep score. "[He] just handed me the headset and said, 'You know basketball, if you want to talk about what's going on in the game, feel free. But if you're too shy ... that's fine also.' I talked to the whole game ... and from there I was calling [NCAA] Division III athletics." But there were still barriers. She once had a minor-league baseball team tell her they wouldn't hire her because she's a woman. "I was so taken aback that I was just kind of quiet and walked out of what I thought was going to be an interview just stunned," she said. "But I used that to ... bring me back down to reality of this career path is going to be a little bit harder for me than my friends." The Yankees' Afterman said she still feels it necessary to "sort of justify myself" in meetings, even though she's a senior vice president, has been an assistant general manager for 18 seasons and negotiated contracts for star baseball players such as Hideo Nomo and Alfonso Soriano for several years before that. Afterman sees potential in the emergence of analytics departments. Instead of trying to break in as a coach or a GM, women can develop ways to communicate advanced metrics to the coaches. That was the route for Samantha Rack, who is with the Cincinnati Reds. The 25-year-old previously worked in the health care sector as a developer, and said her experience since recently joining the Reds is that "nothing feels abnormal" because they're working toward the same goal. Even though she might have had worries about working in a field dominated by men, "I've not come across anything that would make me concerned," she said. But even with the MLB's Diversity Pipeline Program, the fellowship program and an initiative called Take the Field , Tirado said progress will be slow. That's because, she said, MLB is still at the foundational stage of this building this diversity. Baseball is a small world. Teams like humans, prefer familiarity in the hiring process, and what's familiar is men. "I know that guy. And guy, I mean, literally. I know how he works, I know what he does, I know the way he thinks and it aligns with my philosophy," Tirado said. "So we have to break through with that by giving women an opportunity to build out those relationships and show that they can compete at the same level as those men." Some of the encouragement is going to have to come from women like Tiedemann, who reaches out to any new woman broadcaster in baseball in hopes that they succeed and maybe even beat her to the major leagues, where currently there's one woman who's a color announcer — Suzyn Waldman with the Yankees' WFAN team — and one woman who's a public address announcer — Renel Brooks-Moon with the San Francisco Giants. "I would love to not be a story," Tiedemann said, adding she wants to be "just background noise." Like a player's walkup song or the call of a hot dog vendor a section or two over — just part of the game.